It's Thursday! Only two more school days until spring break and my kiddos certainly are feeling it. Poor things have been stuck inside with indoor recess thanks to this absurdly cold spring weather. Cabin fever is on. So, here's a new recipe to hopefully brighten your day! I really try not to post super similar recipes close to one another. However, perhaps you're not really a salad person and Thai Chicken Crunch Salad didn't sound like your cup of tea. Or perhaps you've got a man like John at home... John loved the salad, but wasn't feeling like "cow food" over the weekend. I suggested turning this into a wrap, and he suggested making it a lettuce wrap. The result was a huge hit! 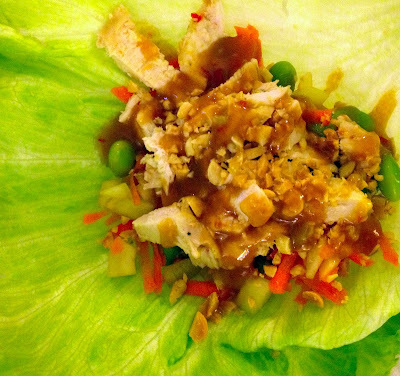 If lettuce wraps aren't your thing either, then try this with a regular tortilla. Mix it up and enjoy! *Preheat oven to 375 degrees F. Spray a baking dish with non-stick spray. Season chicken with salt and pepper, then place in the baking dish. *Combine chili sauce, vinegar, coconut milk, sugar, garlic, ginger, peanut butter, soy sauce and lime juice in a saucepan, whisking to combine. Bring to a boil, then reduce to a simmer and cook for 3-4 minutes until slightly thickened. *Remove from heat and pour half of the sauce over the chicken, turning chicken to coat completely. Set remaining sauce aside to dress the lettuce wraps with. *Bake chicken for 25-30 minutes, or until it is cooked through. *While chicken is cooking, combine all wrap ingredients, except for lettuce and peanuts, in a large bowl and toss. When chicken has finished cooking, let cool for a few minutes then either shred or slice into pieces. *Lay lettuce leaf on a plate. Add wrap fillings, then top with chicken. Sprinkle some peanuts on top and drizzle with dressing. Wrap the lettuce around the fillings like a burrito, and enjoy! Note: For more pictures, see my original post Thai Chicken Crunch Salad! Lauren, these look so good! A couple weeks back, I tried a copycat recipe of PF Chang's lettuce wraps, and I forgot how delicious this kind of thing is. What a great idea to turn that yummy looking salad into a lettuce wrap! Thank you! I wish I could take more credit for them. I need to try a PF Chang lettuce wrap copycat recipe. Let me know if you find any good ones!